Arsenal- From the Sidelines. : Two nil and you fu*ked it up. Arsenal were coming of the back of two horrible defeats. Out of the FA cup against Sunderland, and a disastrous night in Milan. So, we were looking at one of the most important games of the season. Tottenham at home, unfamiliarly above us, and many have concluded that they have been the superior team this season. Well, all that was about to change. Every pundit and journalist said that Arsenal has not been strong enough, that they won't be able to beat Tottenham. Well, all that was about to change. Everyone predicted another collapse that would see us lose out on champions league spot. All that was about to change. I think Wenger shocked everyone when we saw Chamberlain and Gervinho on the bench, with Benayoun and Rosicky getting the starts. And the criticism started, people already concluded Wenger had gotten it wrong. Anyways, that was how it was, and we kicked off possibly the most important game of the season. Arsenal had the worst possible start, and conceded a silly goal in the fourth minute. I must admit I thought it was going to be 'one of those days.' But the players didn't think so, they picked it up, raised the tempo and played their game. Not much later Arsenal were playing like they had the good start. Clever movement, quick passing, threatening corners and crosses. And, unbeatable, unquestionable energy. Rosicky seemed to have the time of his life, making everything happen. 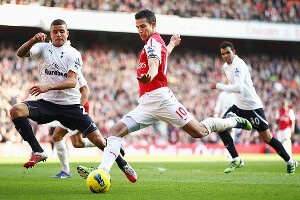 Arsenal came close to scoring, they were banging on the doors and Spurs tried to hit us on the break. And then Bale's dive won them a penalty. Adebayor out of all people converted the penalty. I thought this would take the steam out of Arsenal, they needed to regroup I thought. Again, I was wrong. Arsenal played with the same tempo and energy. Nothing was going Spur's way apart from the two goals. Arsenal were losing by two goals at home, but the player's body language did not show that. Rosicky and Benayoun did more that just justify Wenger's faith in them, Van Persie was too hot to handle and Theo's movement was making ample space for Sagna to exploit. The energy just did not seem to fade! And in the 40th minute, Sagna scored a beautiful header. All the passion and energy seemed to have paid off, this showed how much Sagna wanted this. There was only one place where this ball could have gone, and that was the back of the net. This gave the players even more belief, and three minutes later Van Persie curled the ball into the net perfectly, forcing Gary Neville to call Van Persie's left foot a wand. It really is a wonder, it was a magnificent strike and it bought us back in the game. It was only half time, Arsenal went in the superior side. Now, this is where I thought Arsenal won the game. After the break Spurs made two substitutions. This showed that Arsenal's passion, want, energy and class had clearly gotten into the heads on the Spurs players. Sandro and Van der vaart were not sent in to achieve something, they were sent on a rescue mission. It showed that mentally they had lost the game. Arsenal started the way they had left off, and soon the best player on the pitch, Rosicky got the goal from close range. This goal again showed how much these players wanted this, it reeked passion and commitment. The way Arsenal players charged at the goal was simply brilliant. Even after that, the attacks kept coming. Van Persie put the ball in for Walcott and he scored with the touch of an angel, chipping the ball into the net (Walcott haters, watch the finish again). 4-2. Arsenal still wanted more. The players were on fire. Nothing could stop them. Walcott again had the space and finished beautifully again. The determination, passion and grit that this player showed was unbelievable after being booed in the first half. 5-2. After this, the Spurs players looked lost, the didn't know why they were on the pitch. The game wasn't over, but they had been taught a footballing lesson. Arsenal players showed them what class is. I've always maintained that these players have talent and technique. However, they did not beat Spurs because of clever tactics or superior technique, they beat them through sheer passion and energy. The 'supposedly' weaker team came from behind to score 5 goals. The Arsenal players had walked out of the tunnel with their heads held high and there was no way in hell they were going back with their heads down. Yesterday, these players played with the belief that they deserved to win, with the belief that they are good enough, with the belief that they can beat any team. The game was won before it started, in the minds of the players this was the only way it could end, and they made it happen. Yesterday, you could put any team on the planet against Arsenal and they would have been brushed aside. Not because of superior skill, but because of unmatchable passion and belief. This is a brilliant team, they just need to play every game with such passion. Yesterday Arsenal beat Spurs in every area of the pitch. Modric, Adebayor and Bale were nowhere to be found. The Arsenal players played like they owned the pitch, and all the other players on it. This game will always be remembered. Let me underline what yesterday taught us, ARSENE KNOWS, his faith paid off yesterday, he knows what he's doing, let him do it. And, Theo Walcott is an amazing player, but the fans have ruined his confidence, let's get behind him, and he'll rip apart opponents. Even in the first half, his movement was brilliant, he let Sagna create an impact. Give him the due credit. I've said this before and I'll say it again, this team is closer to success than it seems, the only thing lacking is belief, we saw yesterday what this team can do when they believe they can do it. Let's get behind this team and make them believe that they can. If they play the same way at Anfield, Arsenal will push aside Liverpool, if they play this way against Milan, they'll brush aside Milan, maybe by a 5 goal margin? Who knows. The players gave us a match to remember yesterday, let's make sure that we give them the support they deserve and will remember. The players seem to believe now, it's the fans turn now. The played are going to be charged up for Anfield, thats the way it should be. As always, keep the faith. Arsene knows.